*Offer valid for new Customers only! Your teeth are the precious gift of God, but if the oral hygiene is not maintained, even the best gift gets infected with the bacteria. Unfortunately, most of us limit teeth cleaning to the flossing and brushing, but these aren't everything. The routine oral health checkup can depict the actual health of your teeth. If you are frequently experiencing dental issues, then there might be some hidden reasons that could only be detected with the X-Rays. To avoid dental cavities, the periodic teeth cleaning is necessary as it can reveal the unhealthy side of your teeth. 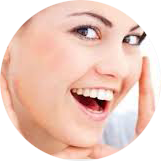 Smile Select Dental is known among its clients for the accurate dental health checkups. Tooth decay is often caused due to bacteria which are living in the deep tooth crevices, improper food nutrition and feeding on the sugary foods also harm the teeth enamel. But, with the proper teeth cleaning, your teeth get rid of the decay! Tartar deposits that build over a time in the dental cavities are the greatest threat to maintain the oral health. However, with frequent visits to a dentist, you will be able to get rid of the tartar that will improve the life of your teeth! Plaque is a white color film that often builds over time on your teeth. This filthy layer is actually acidic in nature that takes no time in making teeth its victim. Though brushing can help, but still the teeth cleaning is recommended to get rid of it! Why My Gums Are Bleeding And How They Can Be Treated? The poor oral hygiene leads to swelling and gum bleeding. This happens when the infection in the gums gives rise to Gingivitis and other periodontal diseases. But no matter how severe the infection is, your gums can always be treated with the teeth cleaning from an experienced dental clinic. Fortunately, Smile Select Dental offers end-to-end dental solutions under one roof for your ease! While a visually conducted oral health checkup can detect most of the dental issues, but still, it is impossible to locate dental issues between the contacting teeth. This is where dental X-Rays come in for help. The dental X-Rays can detect cysts which are often hard to locate visually. So, it helps depict the actual health of the teeth to keep dental issues at bay. Definitely, it is safe! A professional teeth cleaning from a trusted dentist includes the use of technologically-advanced dental equipments. They follow the safety guidelines to give you the cozy dental experience every time. So, you always stay on the safe side during the whole treatment. What's Included In The Service And May I Expect Any Discounts? The offer includes X-Ray, oral health checkup, basic cleaning such as dental exam and teeth cleaning. Yes, we are running with the special offers at this time with up to 92% off on teeth cleaning and oral health check-up. Avail your offer today!